Wheels turning and forklifts filled—that’s one measure of success in any warehouse. If you can increase the amount of product picked up and put away, the more productive and cost efficient you are. 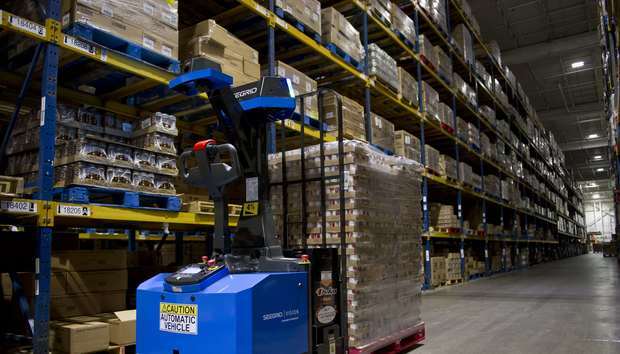 For Pittsburgh-based retailer Giant Eagle, the key to making that happen is to operate vision-guided, autonomous vehicles—robots—in its distribution centers. By eliminating manned travel of pallet trucks in its Pittsburgh and Cleveland grocery distribution centers, Giant Eagle increased productivity between 10 percent and 30 percent, said Joe Hurley, senior vice president of supply chain at Giant Eagle. The company operates between two and four Seegrid vision-guided vehicles in each facility per day, per shift. They’re used to haul freight from the front dock (inbound freight) to the particular aisle where a manned high-lift vehicle then puts the product into a reserve rack. And they do this continually 24/7. Each warehouse is like a mini city, Hurley explained, with robots, manned vehicles and pedestrians (105 to 120 workers, depending on the shift) all working in the same space. Further, each center does outbound distribution the same time it does inbound. It does not have dedicated receiving shifts or dedicated selection shifts. “It’s almost like controlled chaos,” Hurley says. The functionality of the Seegrid vehicles helps keep the order and allows for maximized productivity, said Jeff Christensen, vice president of product and services at Pittsburgh-based Seegrid. Unlike traditional, automated guided vehicles that use in-ground guide wires, paint on the floor, or reflectors and are restricted to specific paths, Seegrid’s vehicles can travel anywhere in a warehouse. Companies do not have to modify their infrastructure to operate them. “We’ve taken a different approach. We take pictures,” he said. Each vehicle has five stereo-pair cameras that operate similar to human eyes. With each pair, the cameras are a known distance apart from each other, and they take pictures at the exact same time. The slight differences between the two cameras (its eyes) tells the vehicle how far away something is—gives it depth perception. “Taking pictures from these five pairs of cameras allows us to have thousands of points in three-dimensional space at every moment along the way as the vehicle drives,” Christensen said. In a vehicle’s initial use, a worker guides the truck through the facility and the vehicle takes pictures all around it, including the floor and ceiling. It finds data from those images and records it. It maps the facility. Because of the amount of data the cameras pull in, the vehicles are able to adjust to most changes, Christensen said. If an environment changes enough that the robot won’t work, customers can retrain the vehicle in the segment where the change is and the vehicle rebuilds the map from there. Each vehicle has sensors to gather data. And all of the data—such as the size of the load picked up, how long it takes to deliver the load, where the vehicle is in the facility, vehicle downtime—are uploaded to the Seegrid Supervisor application. Hosted on site or in the cloud, the app allows customers to track metrics, issue alerts if there’s a problem with the vehicle and adjust the environment if needed. For example, factory managers need to know how many items vehicles moved. They use takt times, such as “The loop to move from my warehouse to the start of the assembly line and back needs to be completed every 43 minutes to keep my production standard.” Managers need to know if the vehicle is within that accepted timeframe. The Seegrid Supervisor can help them track that. Hurley confirmed that his facilities have seen improved productivity using the vision-guided vehicles and the data they gather. The data also helps ensure the robots operate in the most efficient ways possible. “You don’t want to flood the robot, nor do you want to starve the robot. So, for example, the data taught us how to … keep the robot fed in a steady pace” to prevent downtime, Hurley said. Hurley was also able to prevent congestion in aisles. Sensors on robots also prevent accidents—something Giant Eagle’s workers were particularly concerned with when the company decided to bring in the vision-guided, autonomous vehicles, Hurley said. They have a laser-based sensor—the failsafe sensor near the floor—to detect personnel. And another laser-based sensor specifically for other obstructions that come into play. The vehicles also sound a horn at the end of an aisle to alert workers that it is entering the main aisle of the warehouse. Hurley said Giant Eagle’s workers, which are part of the Teamsters Union, needed convincing that the freely roaming vehicles were safe. The company had previously used a system in which guide wires were put into the concrete floor and vehicles traveled a specific path. “We had to make the workers feel comfortable working with unmanned vehicles that weren’t in a tight environment,” Hurley said. “We had to get the workforce to understand that the safety curtains would work." Workers had to get comfortable knowing that if a person gets into that zone, or if the vehicle is programmed to take a turn, it will reduce its speed. And if anything gets into the vehicle's path, it will stop. Hurley said the robots are very predictable, and their controlled features make them safer than human-operated vehicles. After thousands of hours operating the Seegrid vehicles, Giant Eagle hasn’t had one injury caused by them, Hurley said. It’s a six-figure investment to purchase a Seegrid vehicle, but the economic payback in large factories and warehouses is “well under two years—often under one year,” Christensen said. It’s flexible automation that reduces the cost of materials handling and allows customers to keep using the vehicles should their manufacturing process and facility change. “If you are investing in a tool that could be used in the process today and could be used for the process tomorrow—whatever that is—then you are future-proofing automating your environment. That’s another future economic benefit,” he said. The vehicles also help reduce costs for things that are considered non-value-added, such as material handling, Christensen said. “If manufacturers can be more cost-effective in their material handling, then that is healthier for the whole plant,” he said. Hurley said some workers were initially concerned their jobs might be replaced with automated vehicles. But they saw what the robots were doing to protect the interest of the company in the long term. Also, they have learned new skills, such as how to maintain the robots.